World View, out of Arizona, recently completed the longest test flight of its high-altitude balloon, after it was able to successfully stay airborne for five days. Called the stratollite, the ballon aims to carry Earth-observing instruments to the upper edges of the atmosphere and will eventually fly for months at a time. 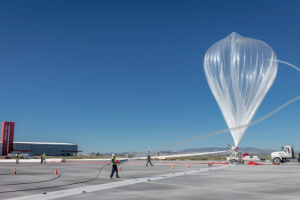 Each stratollite balloon will be tasked with hauling a package equipped with sensors, cameras, and various other instruments to collect data on the Earth below by “surfing” the high-altitude winds in order to continuously over in specific areas. Ultimately, World View hopes the technology will be capable of doing a number of things from weather-monitoring and communications, to disaster evacuation. “This is an enormous leap in our development program and we are certain the stratollite is going to forge a new path in how we observe, react to and collect data about our planet,” Jane Poynter, CEO of World View, said in a statement.